I have the CLC 280 cooler, would it be sufficient for now? CLC 280 looks like it would work quite nicely. Well I'm not sure on memory for the 1950x, It seems alot of the 3000/3200/3400 memory kits listed on the QVL are unavailable or discontinued. I found a few kits on the QVL that were upwards of $400-550 for a kit. I know that it needs a quad channel kit but I've seen many people say a dual channel kit is fine, even the dual channel kits listed on the QVL are hard to find. I'm kind of getting cold feet on moving to a x399 platform, I wasn't counting on $400 worth of memory. Does the high speed stuff matter or are kits under 3000mhz just fine, does the quad channel even matter? Hey guys I can get the 1950x for pretty cheap now at micro center. Is it worth it or should I wait for gen 3? Also how much better would this chip be than my i7 5820k? I game but also am a pro editor using the Adobe CC suite and DaVinci Resolve. EDIT: This is at maximum fan settings. I even tried opening the case up for additional ventilation. Pump feels warm. Might reinstall my noctua later. EDIT #2: Success! Installed the noctua, temps dropped a considerable amount, causing much higher clock speeds. I might try re-applying thermal paste down the road and reinstalling the enermax. You could actually read the 'Ryzen' logo. Much of the thermal paste worked it's way out towards the edges, giving very little coverage for the dies. 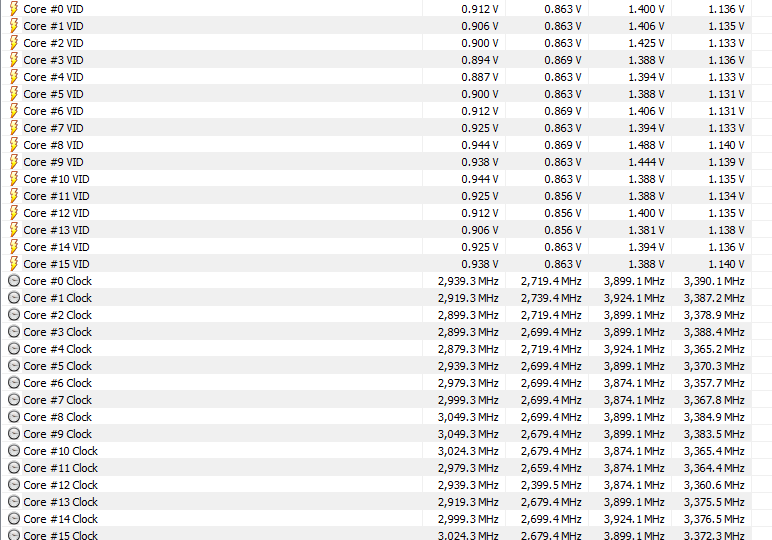 I'm averaging 3.5-3.6 GHz encoding now, with maximums of 3.7 GHz. Last edited by betam4x; 01-13-2019 at 09:14 PM. 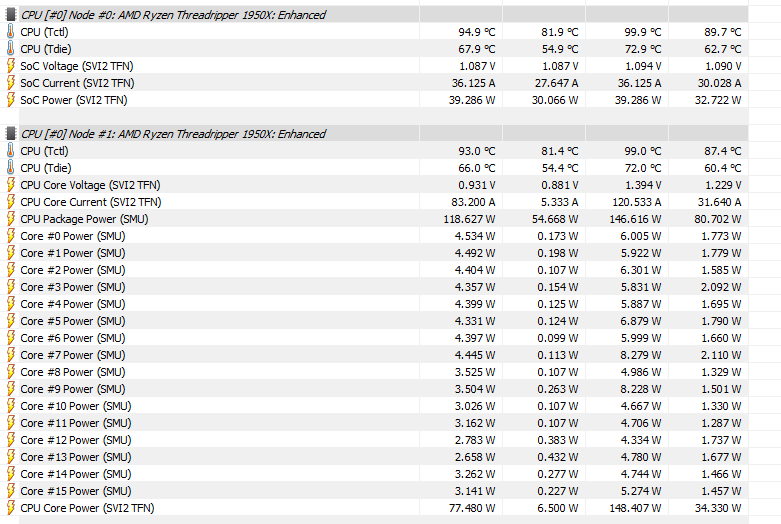 i'm running the cpu at default settings , not overclocking yet ! if i check Core Temp 1.13 , my multiplier is dropping as low as 10 ( instead of 37 ) during these tests ??? Check the cooler installation or your Enermax is a bad unit, generally the pump is dead and you need to call RMA, this CPU idle temps sits around 30-40ºC, your 1950x is throttling hard because of the high temps, be aware! If you can wait 6 months for 3rd gen Ryzen, I would wait. It also depends in how much you will spend on the 1st gen TR4 combo. Quad Channel is pratically mandatory to get good performance with Threadripper, get dual channel and you'll get crappy performance. A 3200MHz kit w/ low latency (usually samsung b-die memory chip - CAS 14) is also a must have if you want performance, 3600MHz is generally the max overclocking speed for TR4 1st gen DDR4 mems. I went from DDR4 [email protected] to DDR4 [email protected] in TR4 and there is a world of improvement in performance. This. 3rd gen Ryzen will have 2 different 16 cores CPUs, both at higher clocks than the 1950x. Had I known, I may have waited. As for the question above regarding a CLC 280, it will work, but it will throttle at 100% load and hit about 68C maintaining around 2600mhz. If you're planning to use it for sustained workloads of 70% load or higher, a true TR4 cooler with 100% IHS coverage is highly advisable. Also, if you're not going to be using it where you'll really see an advantage in multicore CPU intensive tasks, it is a bit pointless.